The Jokerizer is an exciting but simple video slot game created by the Swedish online gaming developers, Yggdrasil Gaming. 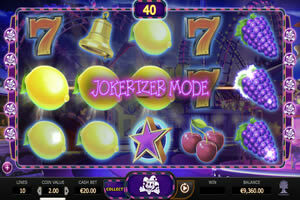 Released in 2013, Jokerizer is the first video slot game to be introduced by this online gaming software company that typically specializes in designing lottery and scratch games, and does not offer the full casino platform. 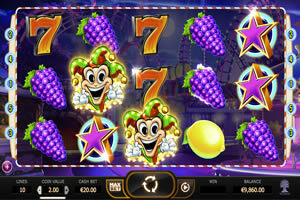 Being a popular video slot, Jokerizer can be found at several online casinos. 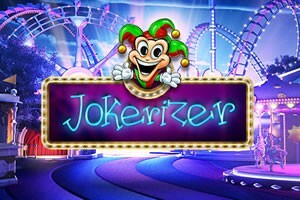 Jokerizer is a fast-paced, traditional slot game with a 3-D appearance that has a pleasing combination of music, effects and graphics, so this game can easily be played for hours. It was made to be a hybrid online game because it is a combination of classic Las Vegas slot machine and crisp video 3-D animations. This video slot can be accessed on a computer or a compatible mobile device using Flash, therefore, it can be played without needing to download any gaming software. Thanks to its convenient platform, the Jokerizer can be played for free or for real money, anytime, anywhere. The Jokerizer is set against the backdrop of a lively theme park. The combination of high-definition graphics and accompanying music gave me the feeling that I was playing this game in the electric atmosphere of a carnival. 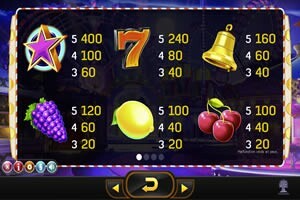 The Jokerizer is a classic fruit slot game, but the slot symbols sparkle and the reels are transparent so it is possible to see the bright lights and the rides that are mainstays at carnivals in the background. The main character of this slot game is the joker, for whom this game is named, so his appearance is significant in determining a potential winner. The Jokerizer is a slot that has five reels and 10 fixed pay-lines, with five pay-lines that pay from the left and the other five pay-lines that pay from the right. The special feature of this game is the Jokerizer mode, hence the name of the game. The joker is the scatter symbol and he appears on reels two, three and four. There are no wild symbols, multipliers or free spins. There is a bonus game that is triggered when there is a winning spin. After a winning spin, the choice is given to either collect the winnings or enter Jokerizer mode to continue playing. In the Jokerizer mode, it costs 20 coins per spin. Every time two or more joker symbols appear anywhere on the reels, the mystery prize is awarded and that can be between 1,000 and 6,000 coins. If three jokers appear in a line diagonally or horizontally, the prize is an automatic 6,000 coins. The Jokerizer mode ends when the credits are exhausted or a mystery prize of 1000 coins or more is won. For the player who likes the no-fuss but beautifully animated online slot, the Jokerizer is the slot that provides hours of entertainment with the opportunity to win big. Along with its attractive appearance, it has the house edge of two percent and a return to player (RTP) of 98 percent. With the combination of the traditional slot, 3-D high definition graphics, the special feature Jokerizer mode, the house edge and RTP percentages, the Jokerizer is an original and innovative concept that all players will enjoy playing. This is a game that has become extremely popular with players who like the simplicity of classic slot games and those who like the new elements and better odds that the Jokerizer mode provides. Because the Jokerizer has become such a huge favorite among gamblers, there are several online casinos that provide this online slot game so it is easy to find.